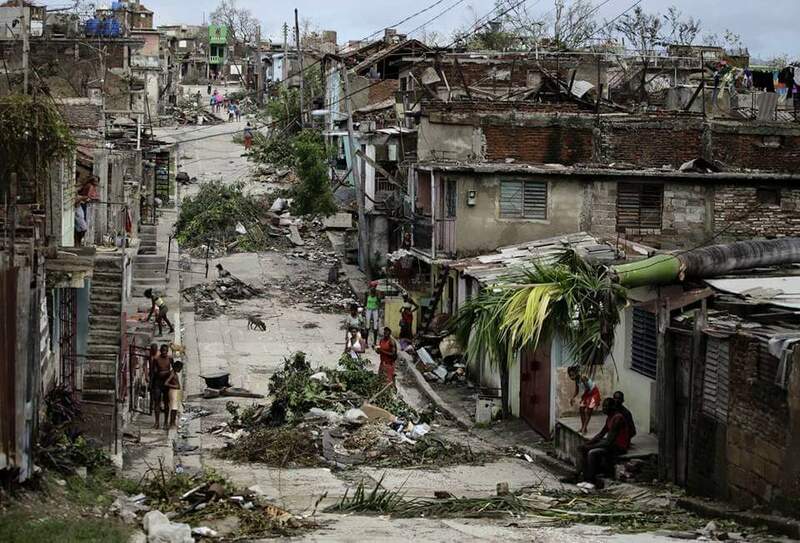 Once again the struggling country of Haiti has been hard hit by Mother Nature. As of this writing all of the people in our projects are alive. With that being said a crisis situation exists. 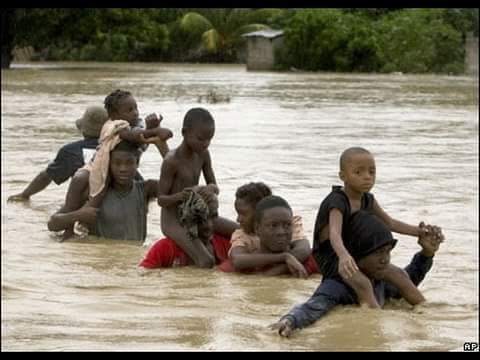 It seems like only yesterday, that the world’s worst human disaster the earthquake of January 12, 2010 buried 300,000 Haitians alive. 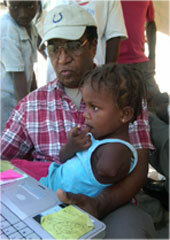 In January 2010, the Haitian People’s Support Project (HPSP) through our friends quickly crossed into Haiti from the Dominican Republic bringing truckloads of food, medicine, clothing, bedding and tents. All the people in our projects were checked on and helped. Shortly after that our medical team arrived. We are proud that we can document that we did much more than many of the big charities that used over 90% of the emergency funds they received for administrative costs. 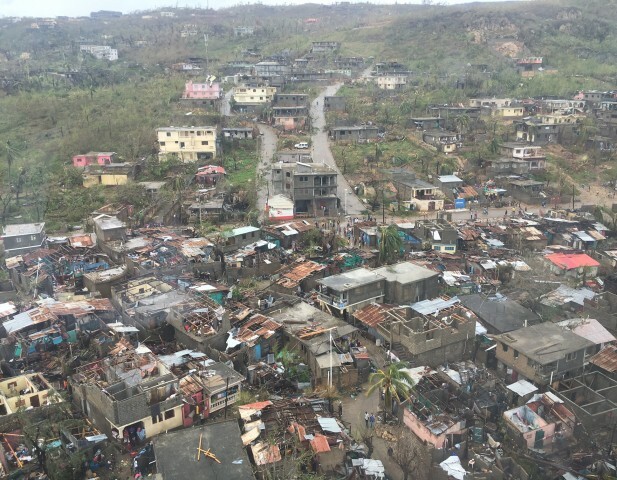 Hurricane Matthew has devastated Haiti’s south and southwest with its floodwaters and winds. Many are homeless, many have died. The food crop has been destroyed. In the wake of this disaster disease, cholera and famine loom large. When the cholera epidemic begin shortly after the 2010 earthquake, HPSP sent Jerry Can water filtering systems to all the orphanages and schools we supported. Jerry Cans are lightweight and each can filter up to about 20,000 liters. The beautiful City of Jeremie juts out to the sea at the tip of a peninsula in the extreme southwest of Haiti. Known as the City of Poets, where the father of the great Alexandre Dumas was born, HPSP has a long and proud history there. During the hurricane 500 people took refuge in a community center we built in 2001 with a team from Living World Chapel of West Hurley. We can’t make contact with all communications out. Reports are grave. But we can and will help. Using Jerry Cans, HPSP wants to set up walk-in water stations in downtown Jeremie. We also hope to ship tents and provide emergency medical funds. 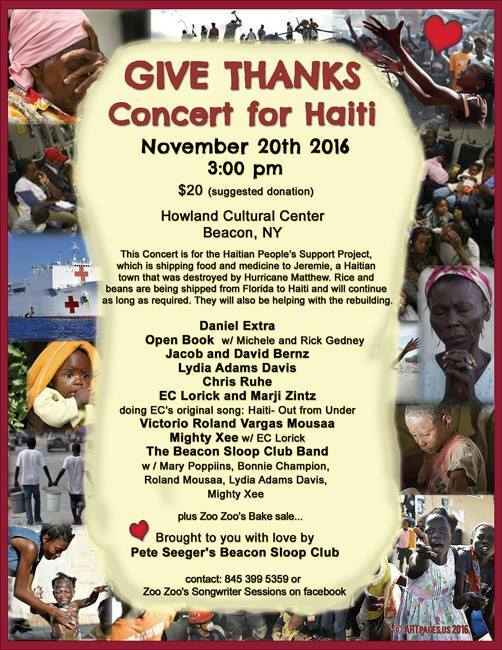 HPSP is a 501(c)(3) founded in Woodstock, NY in 1990. 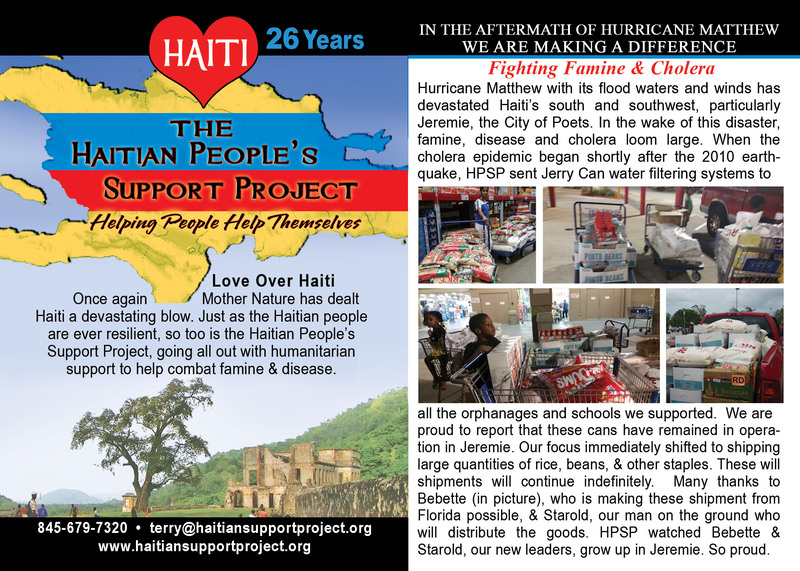 The Haitian People’s Support Project, founded in Woodstock, New York by Pierre and Terry Leroy in 1990, is a not-for–profit, humanitarian organization dedicated to helping the people of Haiti by supporting existing grassroots, community based projects. 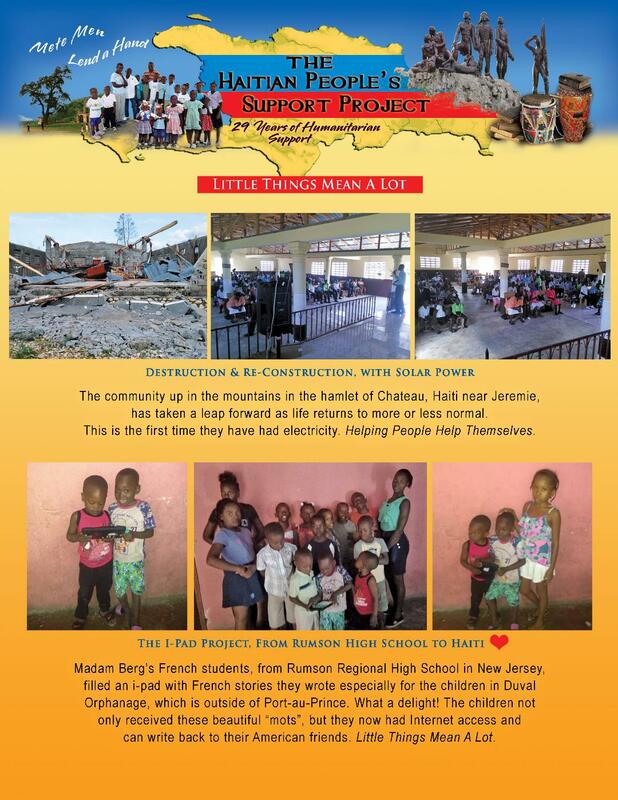 Our mission is to inspire and enable the poorest strata of the Haitian population to have a productive future, to help protect basic human rights and to allow them to make a difference in their country’s destiny. We are guided by the vision of promoting self-sufficiency and independence. We believe Haiti’s future lies in sustainable living projects springing up throughout the country with people in charge of their lives. Decentralization, education, farming, local industry, reforestation and cooperatives offer the potential for dignity and change. 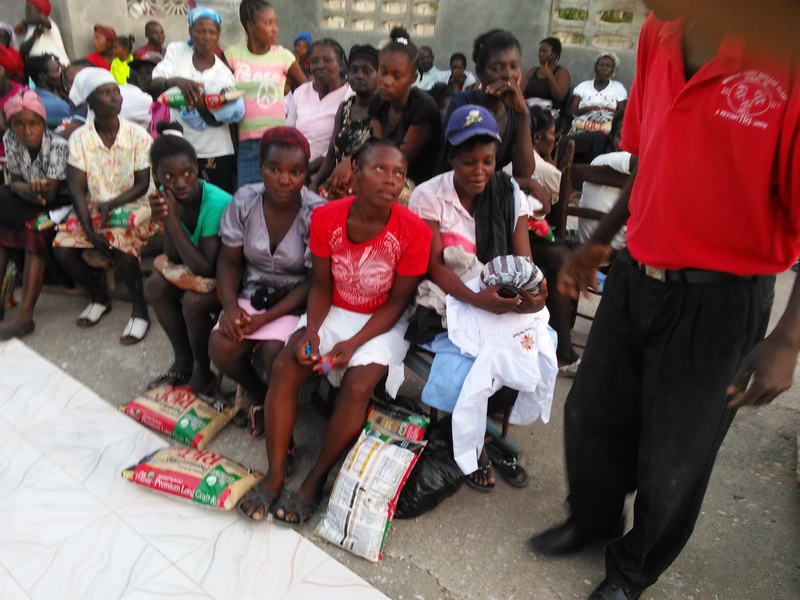 HPSP supports sustainable living, nutritional and educational programs in farming communities, orphanages, schools and temporary shelters throughout Haiti. Our new historic reforestation project in Bois Neuf will help reforest Haiti and combat malnutrition. HPSP will continue to give support to our many existing projects as we move forward in a new direction, with new hope.